My favorite thing is writing, but I also like a lot of other things, but since I have to pick one. I will go with writing. When I write I feel like I step into a different world of mine. Everything is clear and it consists of love and perfection. Though writing can be challenging, it is a great time of self discovery and innovation to be creative. Writing is my hobby and life time goal. When I jump into a story, I am fully aware that I will have a hard time picking out names, and I always try to correct my statements, but this month. That NaNoWriMo month, I am learning to write without correction. 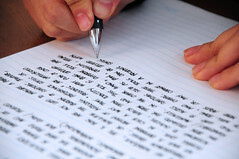 I am learning to write everyday, and though it may seem very tedious at first, it pays off. I have discovered that if I write everyday, then I become more able to read better. I read a little faster, and I am more hooked into my story. Writing may seem a bit disastrous, but in the end it is perfect. Even with all the mistakes and mess ups, for some odd reason, every detail in writing makes sense. It’s beautiful in its own creation. Writing is a way to put and thought, true or false, on paper. It is a way to create a get-away world, where you can hide from everyone and discover a new place to learn and live. To me, writing is the place where I can be different, and where I can learn new things and express myself. Writing is lover and friend, a family member, and a pet. Writing is that sole person who you can share yourself with, and let yourself open. Writing is my life, and I start it with writing one Paige at a time.